In these and other stories in this volume, Lone Wolf and Cub continue to unlock the mystery of the Yagyu, one step closer to the truth behind his quest for vengeance. Prepare for more legendary action, in a handy size that fits in your back pocket! 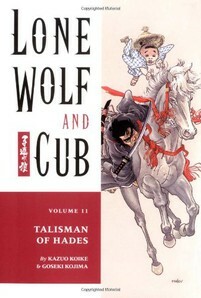 Story and art by Kazuo Koike and Goseki Kojima.